By participants of the workshop convened by the Executive Chair of the MRC. In the UK, black, Asian or minority ethnic (BAME) students account for 30% of all undergraduates, yet less than 8% of the ~1,200 PhD students funded by the Medical Research Council (MRC) self-identify as BAME. Moreover, within this 8%, black students are underrepresented. Why is representation so low? To discover whether BAME students face specific obstacles when pursuing a career in biomedical research, the MRC convened a one-day workshop on October 19, 2018, inviting PhD students funded by the MRC and three other bodies –the Biotechnology and Biological Sciences Research Council, Cancer Research UK and the Wellcome Trust – to attend. As participants, we were encouraged to share our experiences and to help formulate plans for making research careers more attractive for all students from diverse backgrounds. 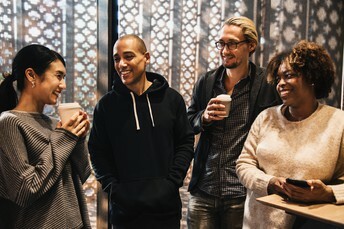 Institutions are encouraged to make a more positive and active effort to be sensitive and inclusive to black, Asian and minority ethnic individuals. Ironically, while many researchers pride themselves on being part of an international workforce, scientists can feel uncomfortable discussing race, and this can lead to the perpetuation of involuntary ignorance of the issues. To face this head on, we started by each articulating one thing that made us feel uncomfortable, and one thing that was helpful. When we looked at all the responses, there were some clear messages. Difficulties included not knowing how to discuss race without embarrassment, a feeling of sticking out, and of being judged by your ethnic background rather than your achievements or interests. All of these comments emphasize feelings of being different and hint at the prevailing isolation that can result. Helpful points included being transparent about our experiences, supporting one another, and recognising that deep friendships often form within a laboratory that can provide safe spaces to talk about race. We heard short presentations by successful scientists from different ethnic backgrounds, which highlighted some of the difficulties they had faced during their career. The speakers were keen to stress the importance of engaging potential ‘allies’, and how it is “exhausting and taxing to consistently navigate an environment where you are the only, or one of very few ethnic minorities”. The speakers also urged institutions to make a more positive and active effort to be sensitive and inclusive to students from underrepresented groups (noting that this is not just relevant to BAME students), otherwise the same mistakes will continue to be made and nothing will change. All of the speakers remarked on the strong influence of their parents in encouraging them to obtain a PhD and agreed that different ways of thinking can enrich the scientific enterprise. We next broke into groups to formulate answers to four questions posed by the organisers. The first two questions asked whether access to PhD training programmes in the UK could be improved, and whether specific challenges are faced by particular ethnic backgrounds. Nobody reported facing discrimination when applying for a PhD. However, it was clear that more could be done to make aspiring researchers aware of their options, and to educate their families. Young people are often unaware of PhD programmes and how to get onto this path. For example the availability of funded programmes is not widely known in many minority communities, and a more targeted approach to advertising could increase awareness. Inevitably in this case, race intersects with gender, geographical location and socioeconomic status. Another issue raised by many of us was that scientific research is often not regarded as a ‘successful career’ for second-generation immigrants, with medicine or dentistry being seen as more secure and financially lucrative professions. Gender stereotypes around being the breadwinner or the homemaker can make it hard for a young scientist to explain and really sell the value of their PhD to their families. “All my aunties and uncles ask me when I’m going to get a real job”, was a remark that resonated with many of us. Challenges faced specifically among female BAME students are the cultural pressures of marrying young, and not being ‘too educated’ to remain desirable for potential suitors. To overcome these hurdles we need to build on existing efforts such as The Brilliant Club, in which PhD students share their experiences in schools in order to increase how many pupils from underrepresented backgrounds enter highly selective universities. Shortlists for competitive PhD programmes can inadvertently exclude individuals who do not possess the resources to pursue unpaid internships; and so academics need to advise undergraduates how they can boost their CV through paid internships. The third question we discussed was whether universities and funders such as the MRC could provide better support for PhD students. We suggested a number of actions to make the laboratory environment more inclusive. Social events that revolve around alcohol can make some students feel uncomfortable, and socializing outside working hours can be difficult for those with family responsibilities. The rituals in different cultures surrounding a death in the family can require a student to be absent from the laboratory for several weeks, and this can be incomprehensible to some lab heads. For some of us, these differences even extend to the food we bring in for lunch, which may be considered as too ‘exotic’ or ‘unusual’. Echoing the experiences of the guest speakers, many of us also find it exhausting to always be the only BAME student in the lab, particularly when it can seem as if sacrificing cultural beliefs and practices is the only way to fit in. Access to a BAME student support network and senior role models would be hugely beneficial, as would mentorship of BAME students by senior BAME researchers. We would also encourage all UK Universities to sign up to the Race Equality Charter as tangible evidence that they are committed to equality and diversity. The final question we discussed was whether the MRC could develop any funding schemes to make a post-PhD academic career more attractive. We heard about the Howard Hughes Medical Institute Hanna H. Gray Fellows Program, which supports exceptional individuals from underrepresented backgrounds after they have received their PhDs: fellows receive 2–4 years of salary and research support as postdocs, followed by generous funding for the first four years of their independent career. Most of us had the more modest request for funds to bridge our salaries at the end of our PhDs until we move to a postdoctoral position. This, and the option to gain experience through internships in other sectors, is important to PhD students regardless of ethnicity. Nevertheless, the concept of a highly prestigious and competitive postdoctoral fellowship programme for BAME students is certainly one that is worth considering. At the end of the workshop we were pleased that our voices had been heard and that the event had not simply been a ‘box-ticking’ exercise. Many of us met peers for the first time who really understood what we were saying and we hope to keep in touch. What is clear is that a forum for discussion targeted at BAME PhD students is long overdue, especially one in which there is a possibility to effect change. For correspondence: Kristina Harrison, Programme Manager for studentships, Medical Research Council.